Fellow Christians - Beware of these "bibles"
In Galatians 1:8-9 Paul said not once, but twice, that those that pervert the gospel would be accursed. Many who are responsible for the changes in the above bibles did not believe that Jesus was God and even a few did not believe in God at all. Knowing this, we can see why they were quite willing to change the word of God. They all leave out dozens of references to the deity of Jesus Christ, and they add words which tend to question His virgin birth, and His substitutionary death (which fully satisfy atonement). The new additions are marked by additions and subtractions. Also, some four whole pages of words, phrases, sentences and verses have been omitted by these new versions. It is not a matter of preference. It's a matter of Satan conning us into thinking both are the same. And conning us into thinking they are easier to read, and therefore a matter of preference. When they are not. The meaning is not always kept intact. Plus, look at the "fruits" they have produced. Some of these new translations are not only watered down, but their serious outright omissions can have very lasting consequences to many souls. Between 1700 and 1900, The greatest missionary work in church history occurred relying on the Authorized King James version. This alone tells us that the KJV (1611) is the true Word of God because of "the fruits" it produced. On the other hand, look at the fruits these new so-called "dynamic equivalent" versions of the Bible have produced (abortionists, rampant homosexuality, and legislators and judges who back those things - Columbine?). Church of England Bishop Brooke Foss Westcott and Cambridge University Professor Fenton John Anthony Hort were the driving force behind the Revised Version of 1881 which these new bibles above are based on. This was a replacement of the pure texts and not a revision of the language of the King James. It can reasonably said that these two men are directly responsible for the spiritual backbone lacking in most pulpits today, because of the changes brought about through their corrupt text. It all began In 1870 when the idea of a modest revision of the King James Authorized Version was sanctioned by the Southern Convocation of the Church of England. This provided the opportunity for Westcott and Hort to introduce their radical changes. Hort and Westcott defended the inclusion of a Unitarian scholar on the Revision Committee. The resulting "The New Testament in the Original Greek" was published in 1881, as was the Revised Version based upon it. When their new bibles appeared in England and America in the late 1800's they were rejected. But, two generations after the failure of the English Revision, the theories of Westcott and Hort had become majority opinion in evangelical Bible colleges and seminaries in both the United States and England. Their theories were universally accepted in modernist seminaries. The Jehovah’s Witnesses and other cults bragged about having Bible translations based upon the Westcott and Hort theory. Westcott and Hort were not only Fathers in the Anglican church. But, according to numerous historians and New Age researchers, appear to be among the Fathers of the modern channeling movement. Channeling and Spiritualism is New Age heresy that are forbidden by the Word of God... In 1993, Gail Riplinger published New Age Bible Versions. In this book, she alleges that Westcott and Hort were practitioners of the occult. It is indicated that they provide a bridge between apostate Christianity and the occult and the New Age Movement. These two "esteemed scholars" were not even fundamental Christians. It is additionally known about Hort and Wescott that they did not believe in: a literal heaven, the literal Second Coming of Jesus and his coming 1000 yr reign on earth. Also, they did not believe in angels, the oneness of the Trinity, and the soul's existence separated from the body. They also did not believe in a literal Devil. According to Hort’s son, Dr. Hort’s own mother (a devout Bible believer) could not be sympathetic to his views about the Bible. Westcott wrote to Hort that he overwhelmingly rejected the "idea of the infallibility of the Bible". Hort says the same thing, the same week, in a letter to Bishop Lightfoot. Hort called the doctrine of the substitutionary atonement "immoral". In doing so he sided with the normal doctrine of the High Church Party of the Church of England. The Low Church Party was generally evangelical, teaching salvation through personal faith in Jesus Christ. The High Church Party taught salvation by good works, including baptism and church membership. Additionally, many may find it hard to believe this about the two men behind these new bibles. Westcott denied that Genesis 1 through 3 were historically true. Hort praised Darwin and his theory of evolution. According to Fuller (page 157); "Textual criticism cannot be divorced entirely from theology. No matter how great a Greek scholar a man may be, or no matter how great an authority on the textual evidence, his conclusions must always be open to suspicion if he does not accept the Bible as the very Word of God." 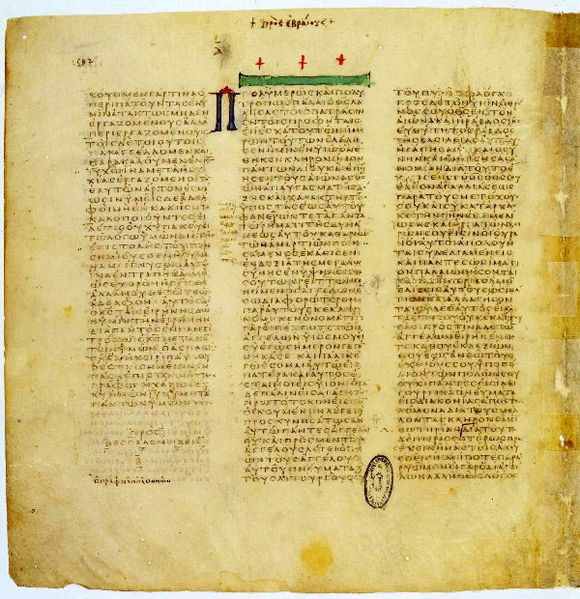 The heart of the Wescott and Hort theory was that the New Testament was preserved in almost perfect condition in two Greek texts, the Codex Vaticanus and the Codex Sinaticus of the 4th century (325-350 A.D.) . Sinaticus was discovered in a wastebasket in St. Catherine’s Monestary (in the Sinai) in 1844 by Constantin von Tischendorf. The Vaticanus manuscript laid on a shelf in the Vatican library at Rome until 1431, and was considered so corrupt that no one would use it . The Vaticanus was found in the Vatican library in 1475 and was rediscovered in 1845. These two men were determined to replace the King James Bible and the Greek Textus Receptus. In short, their theory suggests that for fifteen hundred years the preserved Word of God was lost until it was recovered in the nineteenth century in a trash can and in the Vatican Library. Textus Receptus (Latin: "received text") is the name given to the first Greek language text of the New Testament to be published. 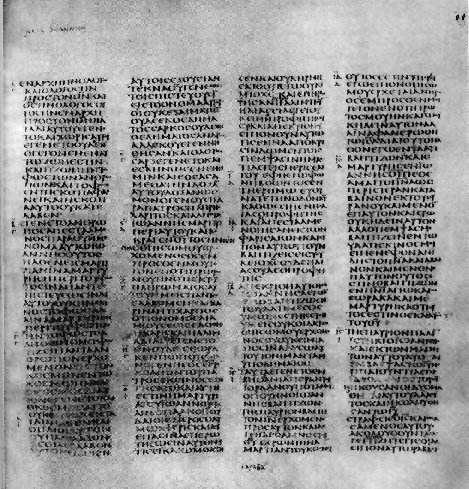 The extant New Testament of Codex Vaticanus contains the Gospels, Acts, the General Epistles, the Pauline Epistles and Hebrews (up to Hebrews 9:14, καθα[ριει). For nearly half a century these notes helped the people of England, Scotland, and Ireland understand the Bible and true liberty. King James despised the Geneva Bible because he considered the notes on key political texts to be seditious and a threat to his authority. Unlike the King James Version, the Geneva Bible was not authorized by the government. It was truly a Bible by the people and for the people. You can see why this remarkable version with its profound marginal notes played a key role in the formation of the American Republic.